Flow: The online user is not very likely to put a real effort in going through a webpage. So, it is critical to maintain an effortless flow and cohesiveness in the content, so that the user can easily wade through it. To introduce the aforementioned elements in your writing, you must use conversational tone and direct speech. Economy of words: Wordiness absolutely mars the readability of any piece of writing. Website content must be to the point, concise and consistent. Remember that the online user is always in a hurry. Accentuate: In order to enhance the readability of your content, you must supplement it with images, hyperlinks, bullet points, headings and subheadings. There can be overwhelming amounts of content on a webpage, making an arduous task for the user to find what he/she may be looking for. Therefore, the content should be laid out in a well defined structure with clear and concise points illustrated with images. Adapt: While writing, you must be aware of the kind of user would be reading your content and where exactly the content would be placed. It is important that the content on the webpage confirms to the overall theme of the website and the audience it would cater to. Invert It: The age old principle of inverted style of writing holds good for website content writing too. Position the crux of the content right at the beginning and shift the accessorial details to the bottom. In all probability an online users is going through a web page because he/she needs a ready access to useful information laid out in a simple fashion. A content writer for a website must serve this primary and basic need of the online user. The digital age brings with it many irresistible evils, one of which is the ease of copy-paste of content freely available on the Internet. With regard to the amount of knowledge that the digital age has made, it has become so very easy to share collaboratively, I often thing what use is adding any more information when a lot is readily available to be used over and over again. Someone correctly said that “in the digital age, it’s not plagiarism, it’s repurposing”. Speaking in the context of writing, one of the biggest revolutions that has ushered in is easy availability of copious information. We don’t even know how much text is within our reach. And here is the problem. The biggest problem that most of the writers are facing today is, not needing to write any more any longer. It may seem as the biggest paradox ever, but it’s true that with the diminishing need of having to write content, the content writing industry today is at its peak nowadays. The focus today is just not creating content; that, the homosapiens have been doing since ages. The concern for the industry today is to negotiate the information that is available in a humongous quantity. Imagine how difficult or challenging it would be to create 20 writings on the same topics. The task ahead of writers is towering. Writers across the globe share the same content pool and creating different versions to save the work from being tagged as “copied” is smart art. The ‘unoriginal genius’ should not be mistaken as someone who remoulds content intelligently. That definitely is a leverage that is available to them. Young writers can’t be stopped from taking cues from the given content pool. Repurposing the information according to your need has become essential. Almost everyone does that. Students do it. Writers do it. Damn! Even lyricists do it. A) Isn’t it the need of the hour that we question our marketing strategies? B) Are we able to capture data effectively to make smart business decisions? C) Is what we do today in synchronization with what’s to come? As the consumer becomes more empowered, it has become indispensible for businesses to best deploy their limited/given resources. But, when was marketing just about survival? It was and always remains about competition. Rise in conglomerates and diminishing global boundaries leave us with the only option of rethinking marketing. So what is it that you can do to prepare a better landscape for changing consumer requirements? We believe that going by the “market-trend” will help. Read on to know what the marketing gurus say. Expenditure on Digital Will Increase: We all know, “digital” is the new buzz; and, it is to stay. The face of digital marketing may undergo some drastic changes, but in no way will it fade out so soon. Marketers, gear up to see some surprises on this front. Don’t give on digital this early. Data Will Play a Big Role: In knowledge- driven economy, all that matters in information. The data about customers and client will be playing a significant part in moulding marketing strategies. Many will say that it always has, but then they forget that that marketers often make consumers “realize needs or desires”. With data empowerment, businesses will do it better; better than ever before. Riding the wave of change has made many businesses brain-storm. Major investment and serious thought is going into creating digital spaces. Content and communication are being used as new age weapons to fight for the biggest market share. Where PPC used to derive 30% of the sales some 5 years back, majority of the business comes from SEO and digital marketing. It all started on a cozy afternoon of January winter, when I was in the process of reinventing myself and was looking for venues to explore my inner self. To tell you the truth, I was sitting idle, jobless with an elaborate research paper to be written. So, with a lot of bottled emotion, I decided to take the most random of journeys. I registered myself for the Jaipur Literature Festival on an online portal, got a ticket done for an early morning train from Delhi Cantonment to Jaipur and fixed an accommodation at army mess (courtesy: my colonel uncle). While in Jaipur for a literature festival and travelling alone, I had plans of my own. First one being how am I going to archive this memorial journey? So, I thought of the strategy that was to be followed for the next three days. Day 1: Deciding on going local: To have my travel writing turn out a good read, I thought of taking the easiest and most sought after conveyance of the city. So, I ended up travelling in an auto rickshaw all by myself. For fellow travelers, it is good to try out the local ride which takes you through the heart of the city and you get to see much to write about. Day 2: Grabbing the city highlights: While Oprah stole the scene on this day and being left out of the venue because of the enormous crowd, I decided to catch the very important sight-seeing session. Again, I just hired an auto for a complete day covering the City palace, Hawa mahal, Amber fort. In fact, a good suggestion is to go on foot while exploring the market (which I did). It gives the traveler a complete picture of the town, the feel of the local business and what’s popular. Day 3: Taking the plunge to discover more: It was a decision which took some time but I jumped on the idea. This day was dedicated for the trip to Ajmer Sharif. I took the local bus that runs to and fro (and turned out a decent ride) from Jaipur to Ajmer Sharif and visited the ‘dargah’. While doing so I interacted with the local group of people, the ticket in-charge, the shop keeper, a man at the shrine, and it added to my knowledge of the place. Before taking off from Jaipur, I had a clear idea as how my strategy of exploring the city has turned out and how good it is going to be when I get to pen down the experience. It turned out well it seems! Do you also feel that good content is one that entails perfect grammar and punctuation? Every careful content writer would feel so! So, what are the points that you pay heed to when you write? Are the ones below among them? 1. Active vs Passive. As far as possible, use the active voice. Using passive voice is necessary only if the object is unknown. So, if you were to write ‘Sita ate the grapes’, avoid writing “The grapes were eaten by Sita.” With the need for content to be more conversational and interactive, active scores much better over passive voice! 2. The Subject-Verb Agreement. This often happens in long-winded sentences. While talking about the subject, the mind meanders and forgets that a singular subject always takes a singular verb, and a plural subject a plural verb. Starting a sentence with “It is a good source of energy…” and losing the way into “… and provide substantial amounts of…” is a clear indication of a writer lost in their own thoughts! 5. Correct Placement of Modifier. Now, don’t you think taking care of the above will help you write better and more effectively? Feel free to share more such instances of incorrect grammar of used. Gone are the days, when people would queue up in departmental stores to pick up their t-shirts on sale. The principle custom of being physically present to buy, hand out the cash is now a fondly remembered memory. Now if someone has to buy anything under the sun, they need only log on to the internet and shop to their heart’s desire. Technology has increasingly mobilised the social functions and with the Internet, now deemed as the new virtual residence, it need not come as a surprise that most MNC’s would want to revamp their image to keep up. Content is, therefore, the undisputed king of the virtual world. It will either put a website on the proverbial marketing pedestal, or will drown the website to oblivion. This leaves the web content writer with an immense responsibility. He is expected to have the required foresight to be able to predict the changing trends in search engine optimization and use them to the best of his abilities. When writing for the masses, one requires finding ways to make them click, access and treat the content as per the website’s intentions. To do this the content writer must have an in-depth knowledge of the subject at hand and must strategise his appeal for the masses. Although writing content for a website does not have a standard set of rules, but if a content writer manages to grasp the subtle nuances he will be able to produce a winning copy. Marketing is just a game played to lure in mass attention and to be at the top of this game, one only needs to understand what makes the audience click. Thus targeting the audience and shaping the content to suit the tone of voice will make the reader feel a connection. In this regard, the appropriate use of words in the required frequency and tone is what will work in favour of the content. Even with all the technicalities in place, what makes content readable at the end of the day, is the language. So the writer cannot bombard the content with difficult words and phrases. The challenge however will be to create appealing content without compromising on quality. Web users are aware of how precious time is. Even when they choose to aimlessly surf the web, they would prefer to view content that takes the least effort to read. So the content writer cannot hope to hold their attention with volumes of text. It needs to be concise and interactive. Using an audio visual medium will do more than just enhance content. At the end of the day, establishing a connection with every John Doe is what every marketing enterprise roots for. A certain Tulip Garden restaurant decides to revamp their menu to attract vegan customers. Word of mouth – being the less effective method in the small community that it was- the business suffered due to lack of proper marketing strategies. So the restaurant put up an interactive game on their website akin to Farmville on Facebook in which the player grew their own produce and made their own Garden burgers. The game also provided opportunities to be able to find hidden free burger vouchers, to enjoy the same, in real at the restaurant. The links were shared on Facebook and Twitter. Soon the game became viral, attracting almost 500 retweets and over 100 shares on Facebook. Their business made most of the situation and the average vegan, found a perfect BBQ styled vegan burger within a stone’s throw. We are living in the age of the “sharing” economy, where social media optimization (SMO), one of the many methods, is used as leverage to market products and services. In the world, where grabbing eyeballs is better than delivering lackluster information ; where ‘likes’ and ‘retweets’ are the rule of the land, social media marketers must up their game in order to be in the proverbial spotlight. Like a dress on Etsy? Share it with your friends on Facebook, Tweet it! Stumble it! Digg it! Your friends can discover the link in their notifications, and voila! more traffic redirected to Etsy. Social media is an indispensable tool for growing businesses, who want their followers to discover, consume and engage with their content effectively. And to that end, the content strategy must be rich and should allow the recipients to coherently convert from content to conversation, from conversation to relationships with the brand or company, from relationships to potential businesses, and from businesses it to ROI. To achieve this SMO must centre on generating dialogue, influencing collaboration, effective segmentation, targeting, and focus on personalized customer attention. At the end of the day social media marketing requires you to be socially active virtually. Web users no longer look for information with the sole expectation of achieving just results. They wish to interact, connect with the results before they form their opinions. They visit pages that their friends recommend and click on shared links. With this degree of personalization the brand needs to come across as real to the consumer. In this regard specific keywords and links is the new moolah vending strategy for SMO. Thus when a searcher brings forth a query on a search engine, the result is displayed along with matching ads that redirect him to further resources on other websites. 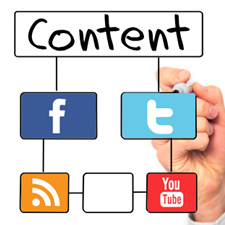 In a world of social media marketing strategies lost – Content is the newfound ‘Holy Grail’.